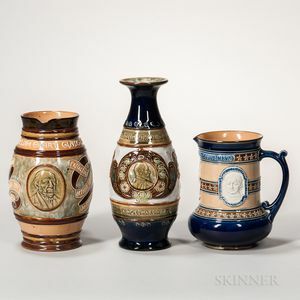 Three Doulton Stoneware Commemorative Items, England, late 19th/early 20th century, a Royal Doulton vase commemorating the coronation of Edward VII and Queen Alexandra, ht. 11; and two Doulton Lambeth, a jug commemorating the World's Columbian Exposition in 1893, ht. 7 1/4; and one with portrait of Gladstone between two ribboned verses, ht. 8 3/4 in. ; impressed marks.